Eating on Whittier Zen Dinnerware from Ten Strawberry Street will enable your guests to unwind and relax and achieve a peaceful state of mind as they indulge in your freshest culinary creations. 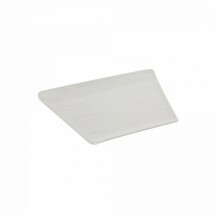 This restaurant dinnerware, made of white porcelain in a trapezoid shape, features thin, delicate edges, that will serve as the perfect palate for light appetizers, desserts and healthful entrees. This collection is dishwasher and microwave safe, and is a great choice for Asian restaurants and sushi bars.